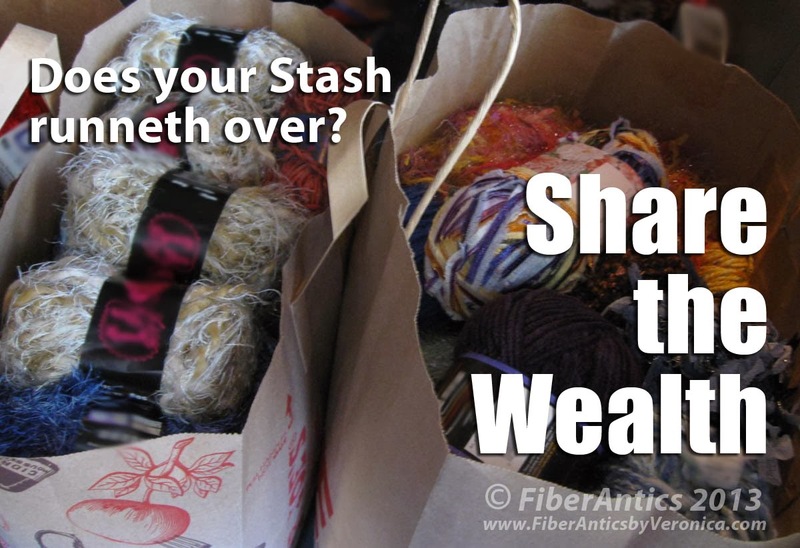 Fiber Antics by Veronica: Does your Stash runneth over? While doing some end-of-year re-org, I took a little inventory of my fiber and fabric resources (aka my Stash). As with many of us long-time fabric and fiber enthusiasts, I uncovered several items that I knew I would never find time (even in two lifetimes) to use, or my interest in that particular "fiber trend" had waned. Conclusion: Time to purge! So, two big bags of fabrics and scraps went to my MIL's church group that makes Prayer Quilts and four bags of yarn and fabric scraps were delivered to the Northside Neighborhood House. I'm happy knowing that someone will be creating something with their hands, getting enjoyment from the process, and feeling a sense of accomplishment from making a project. There are lots of churches, schools and organizations that can make good use of your unwanted—but still good quality—needlework, craft, sewing and quilting supplies. Ask around and I'm sure you'll find several. If you choose, you can claim your donation as a tax deduction (you've got one more day to do this in 2013). Me? I'm happy knowing someone will be using this stuff and I've gained a little space in my studio. So, share the wealth! And, don't worry. Stashes magically replenish themselves… amazing how that happens. Gosh, if I only had some stash. Just wait, it will replenish itself. I know how that happens.